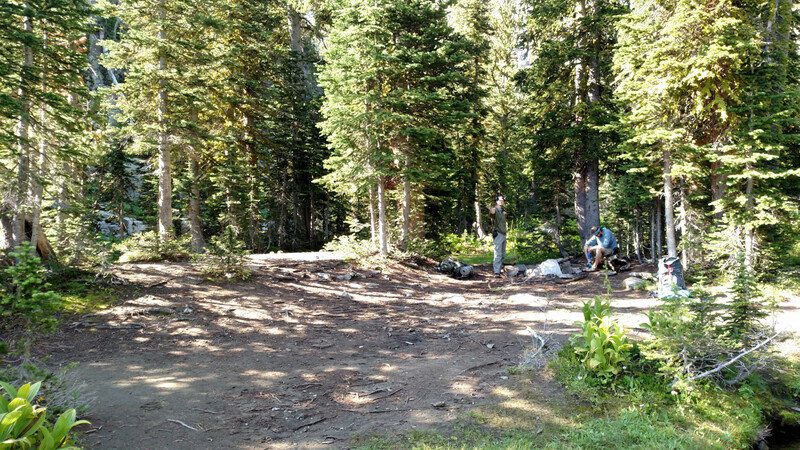 Campsite Availability: Some scattered around Blue Lake and Granite Lake. Camping at Halfmoon Campground. 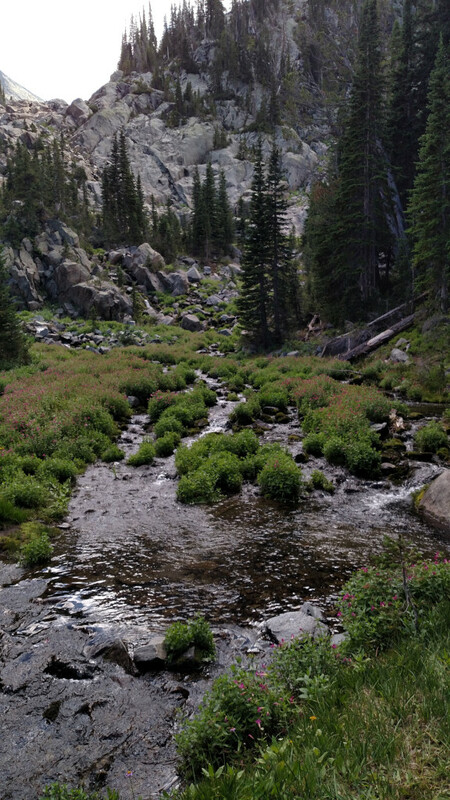 Trail Features: Creeks. Waterfalls. Lakes. Fire Restrictions: No fires with 1/4 mile of Twin, Blue, Granite, and Thunder Lakes. 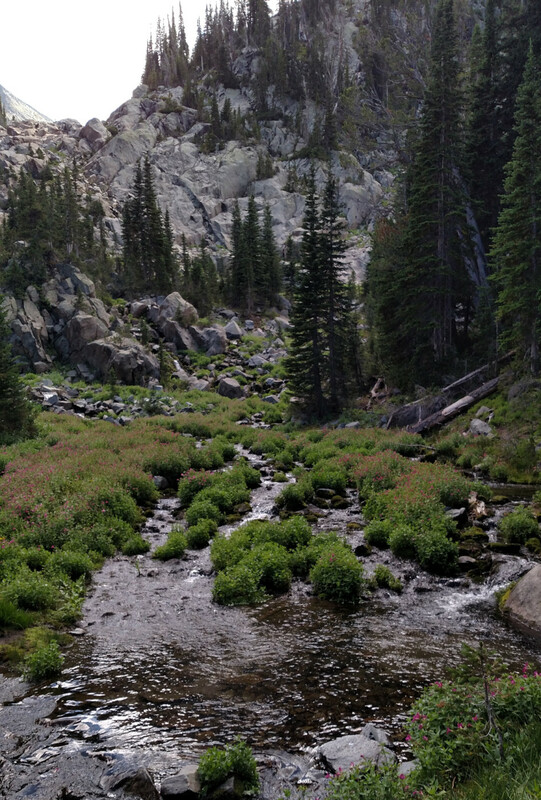 Stream Crossings: Must wade across a stream at the southern end of Granite Lake. 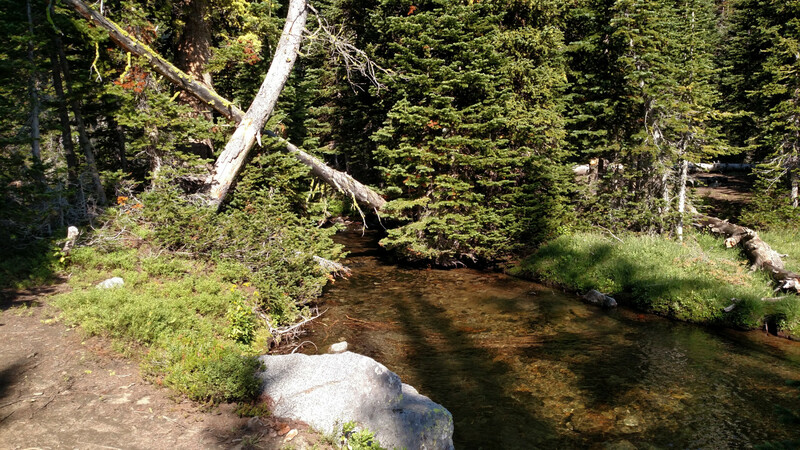 Water Sources: Trail follows streams the entire way. 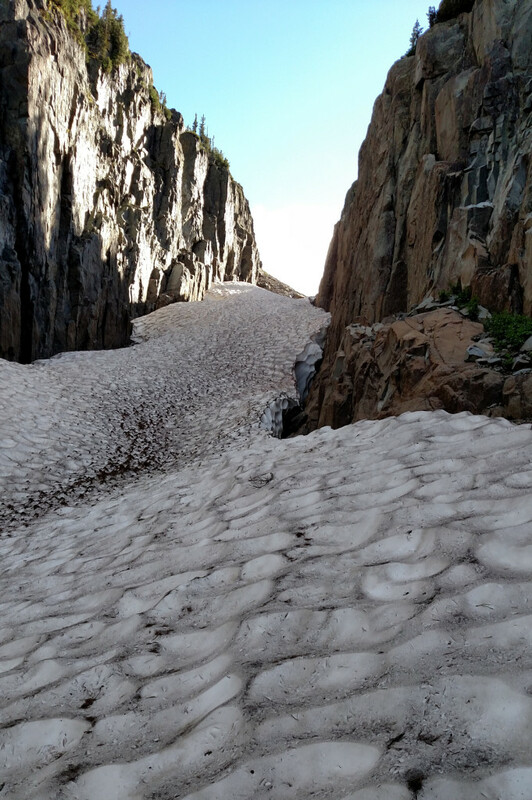 Snow: In the gorge leading to Pear lake and some on the surrounding mountains. 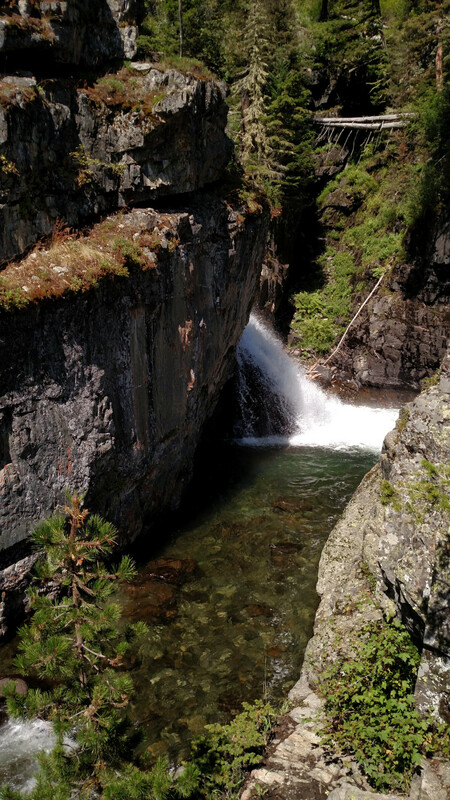 Side Quests: Thunder Lake and Falls. Blue Lake. Pear Lake. Druckmiller Lake. Crazy Peak. Granite Lake is one of four lakes, accessible via the Blue Lake Trail, to the northwest of Crazy Peak, the tallest mountain in the Crazies. 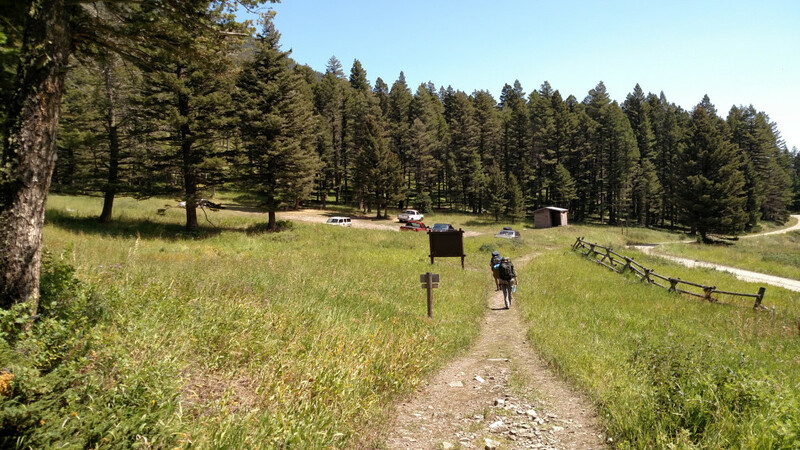 The Big Timber Creek trailhead is one of the few access points to the Crazies and is therefore a popular destination for locals. It is, nonetheless, a worthwhile trip if you can deal with the crowds. 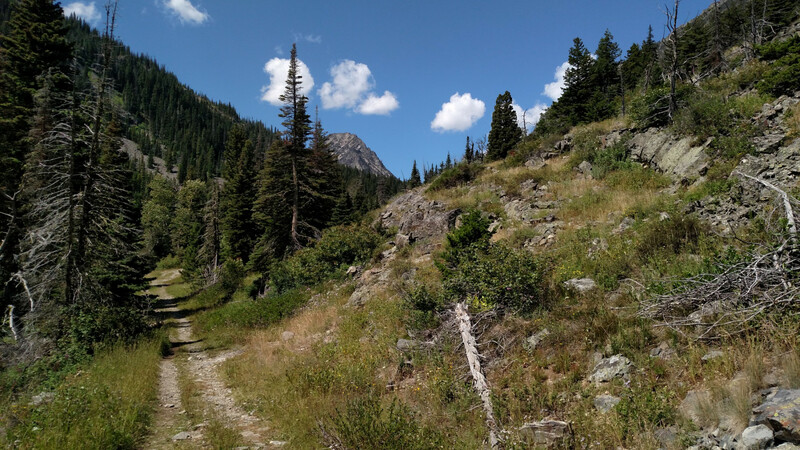 The first half of the trail is spent in the shadow of Big Timber Peak to the south. 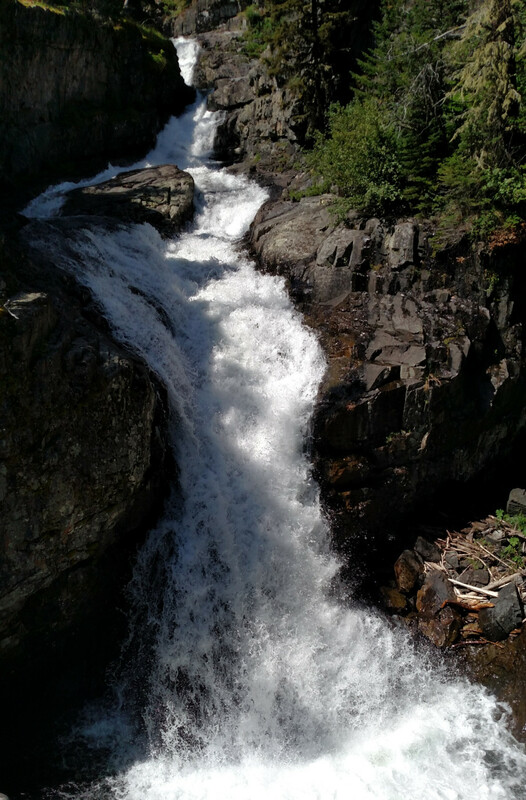 It’s a gradual uphill climb and passes several gorgeous waterfalls. This is followed by a fairly steep ascent to an overlook above Granite Lake. 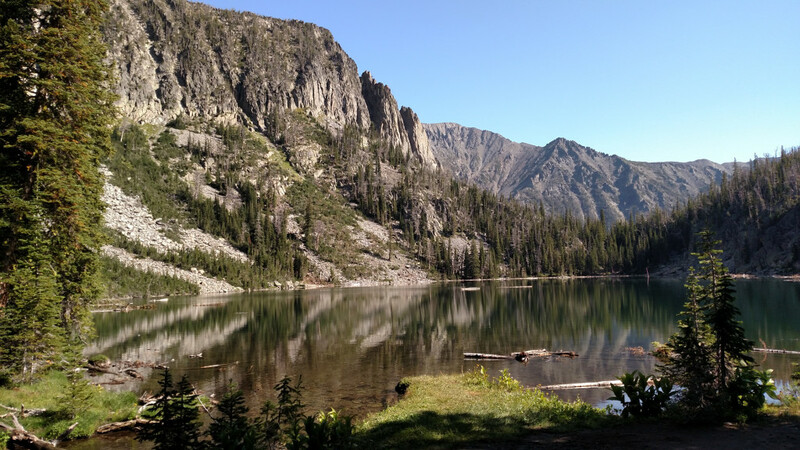 There’s a decent number of campsites around Granite Lake and the adjacent Blue Lake. Either lake could be used as a base camp for those wanting to summit Crazy Peak. 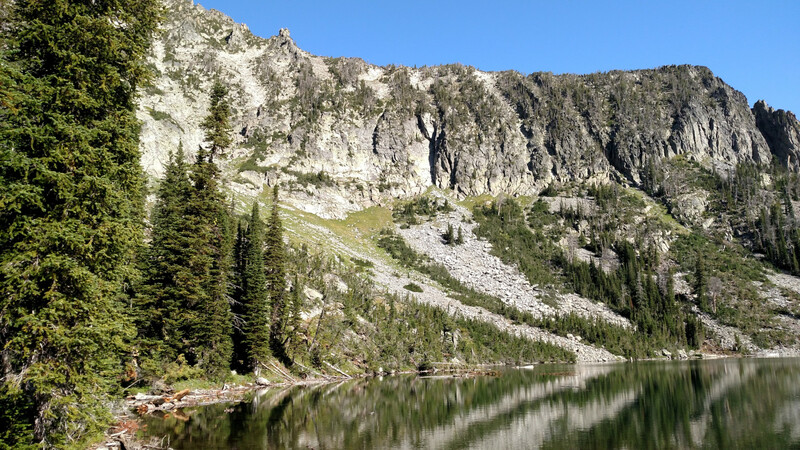 It will take some bushwhacking to get to Peak Lake or Druckmiller Lake but either could be done if you’re willing to put in the effort. If heading to Pear Lake do not try to climb straight up the drainage. 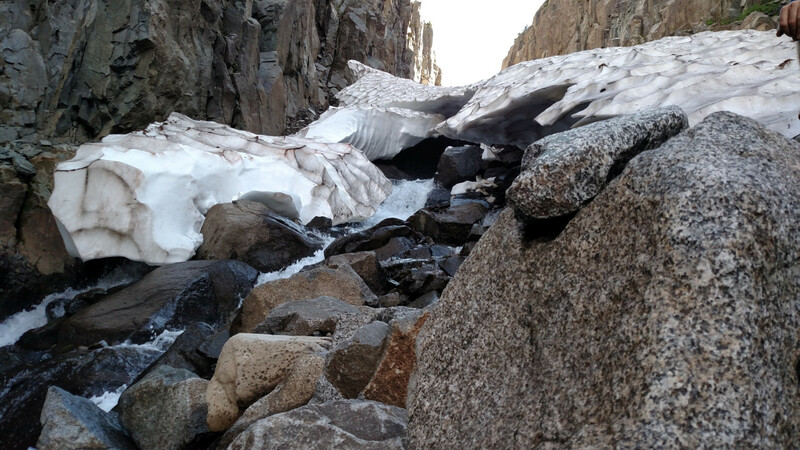 The creek, although flowing, is covered with a thick sheet of snow (that apparently lasts all year) making the traverse extremely dangerous. The intricate maze of razor sharp ridges and glacial valleys that makes up the Crazy Mountains is enough to keep a person busy for years. I was hooked on their magnificence after just two adventures there and felt a deep compulsion to return for a third. We’d seen what the west side had to offer but the rest was still a complete mystery so we decided to aim for a cluster of five lakes on the east side of the range. 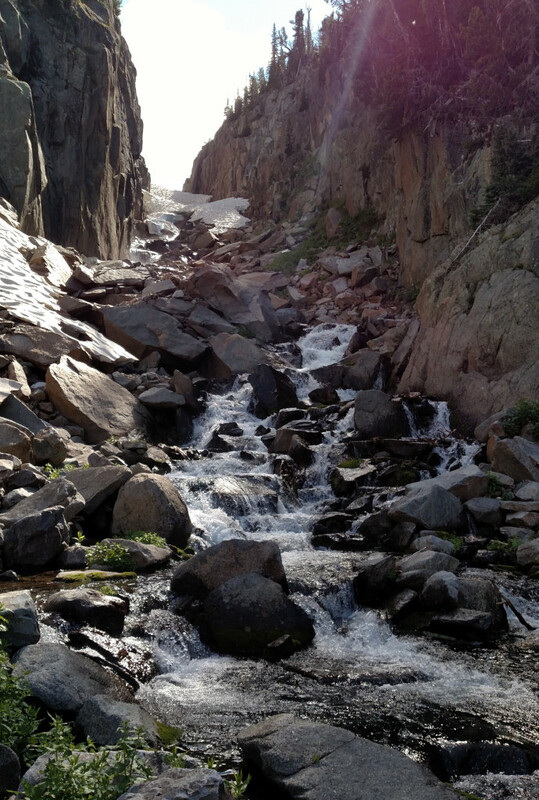 The lakes can be accessed via the Big Timber Creek trailhead, the only access point on the east side of the Crazies. 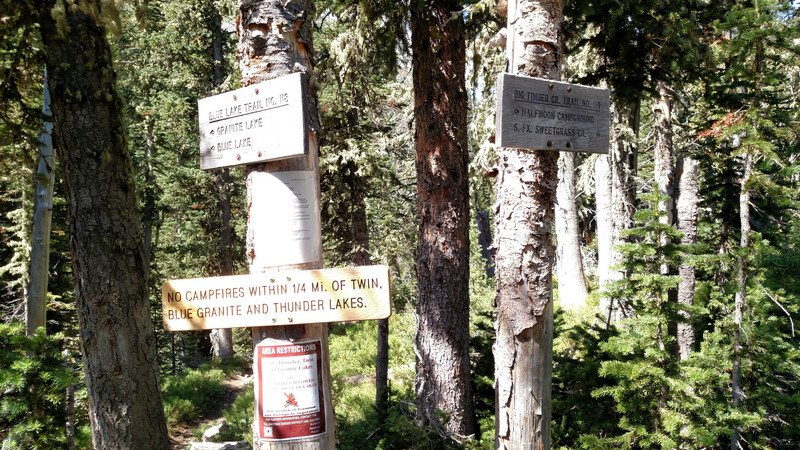 It’s a gentle uphill hike that follows Big Timber Creek to the Blue Lake Trail which continues another 1.5 miles to a basin harboring Thunder, Blue, and Granite Lakes. 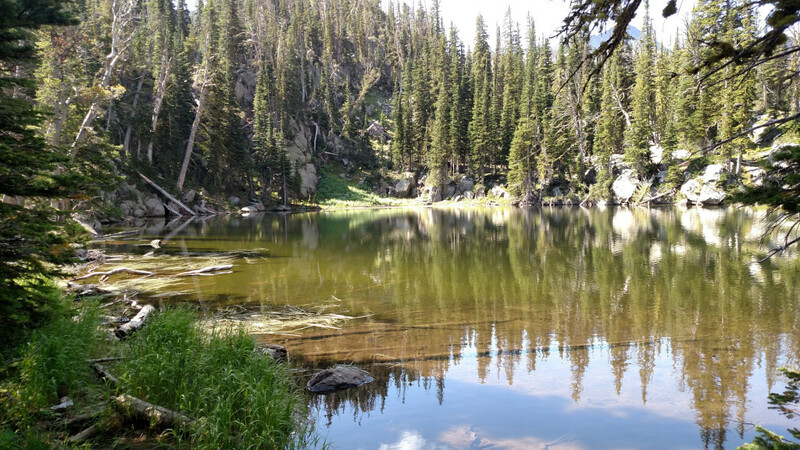 The other two lakes, Pear Lake and Druckmiller Lake, can in fact be reached by anyone willing to bushwhack through some questionable terrain. Ultimately we decided on Pear but if things went awry, knowing deep down they probably would, we certainly wouldn’t have trouble finding another lake to stay at. As we approached the Crazies from the east along Highway 191 the 11200′ Crazy Peak could be seen jutting into the heavens, clearly establishing its dominance as the tallest peak in the range. 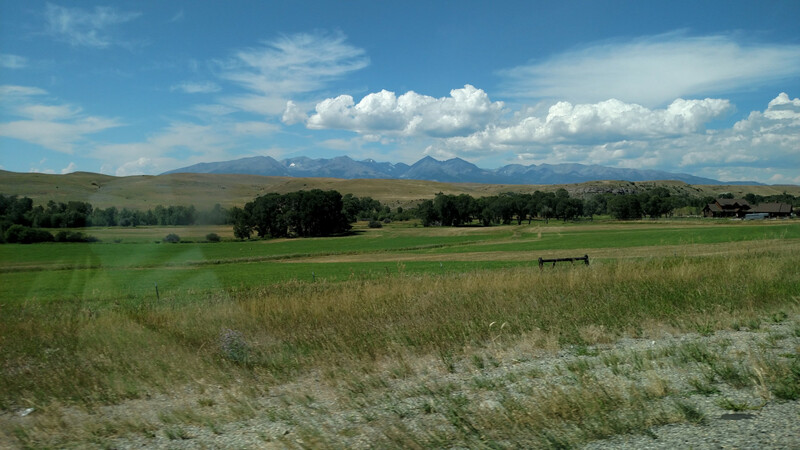 Excitement filled my mind as I gazed upon the mountains and thought about the plethora of new hiking options that would be available. East side of the Crazies. Crazy Peak is the pointy beast in the center. The Big Timber Canyon Road follows Big Timber Creek to the Big Timber drainage (apparently Big Timber is all the rage around here), possibly the most popular access point for the Crazies. 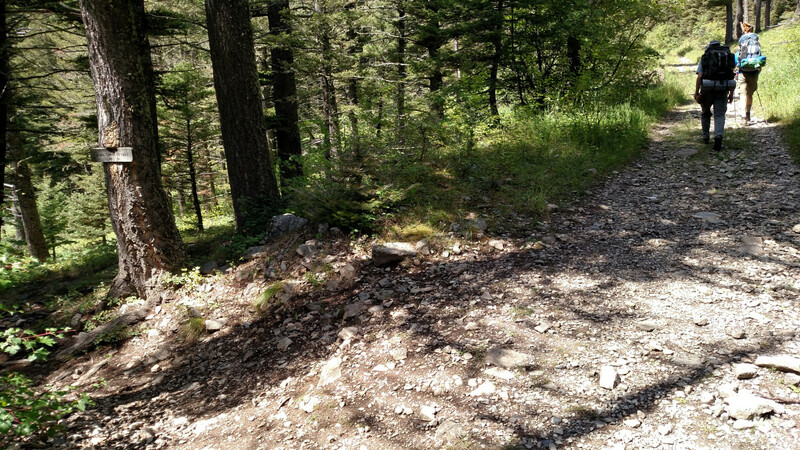 It’s a rickety, but 2 WD accessible, dirt road that drags on forever (like many Montana roads) and finally terminates at the Big Timber Creek trailhead near Half Moon Campground. 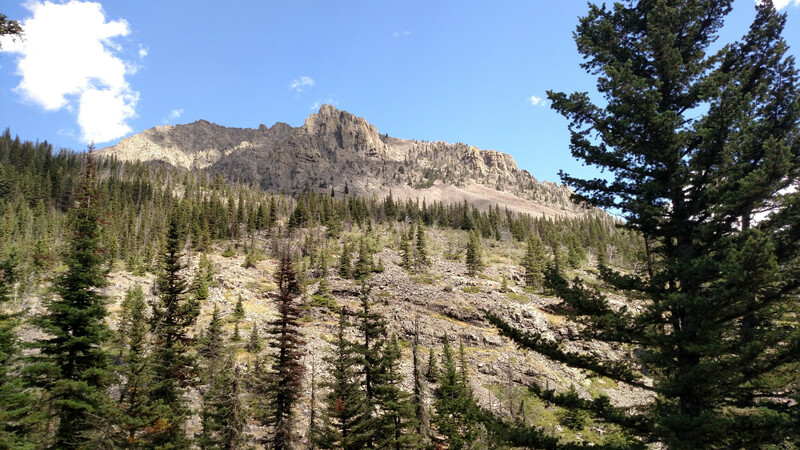 Big Timber Peak, another monster, towers overhead to the southwest. 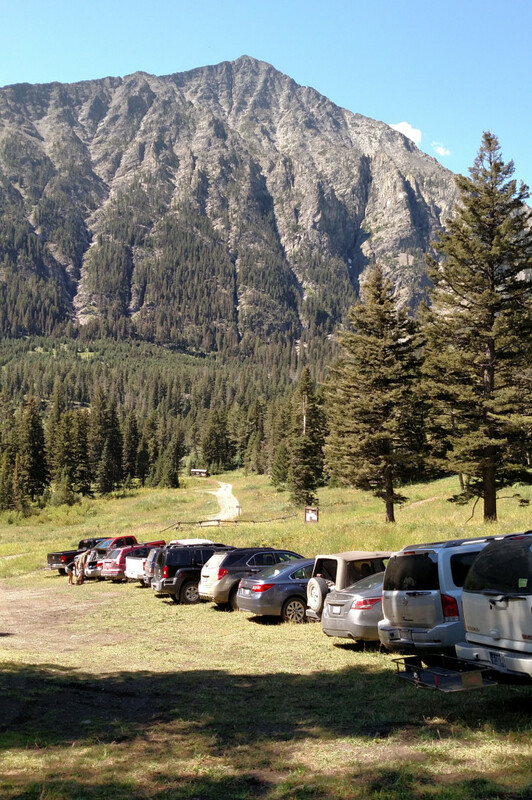 There’s no denying the popularity of this trail; the parking lot was almost full and it was still early in the day. Big Timber Peak towering over the parking lot. While we prepared to depart the lot, a vehicle parked next to us and a pair of hikers got out. One of them, an elderly chap, approached and immediately asked, “You guys headin’ up to the peak?”. “Peak? What peak?”, I thought to myself. Apparently, the hikers in this area don’t mess around. They assume that everyone with a backpack is heading to Crazy Peak which, although doable without ropes, was way out of our league for today. He proceeded to warn us of the notorious “chimney” section near the summit which should be treated with extreme caution. I am hopeful that a future expedition into the Crazies will lead us there. We exchanged a few more words with the hikers, wished them luck, and got on our way. 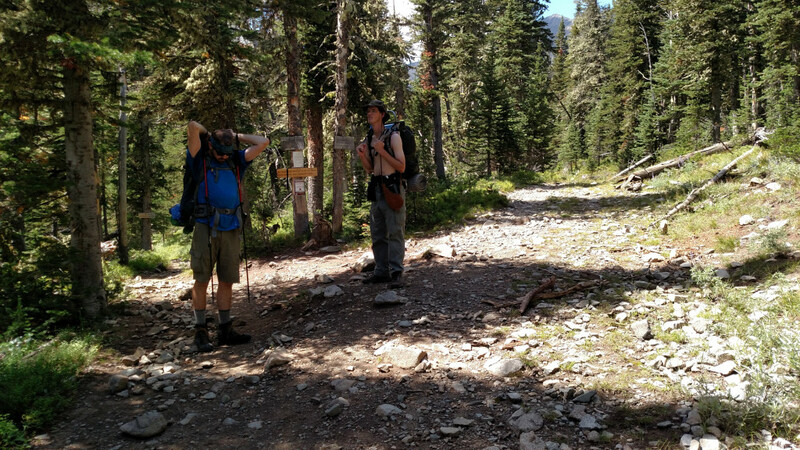 The trail starts out easy with a gradual climb up the Big Timber drainage. At 0.4 miles a short trail branches off to Big Timber Falls. The falls are gorgeous and well worth the visit. The trail then continues up the canyon, crisscrossing the creek several times before arriving at a three-way junction about 3 miles in. Straight ahead, the Big Timber Creek trail leads deeper into the Crazies passing Twin Lakes, another hot spot, and Glacier Lake. 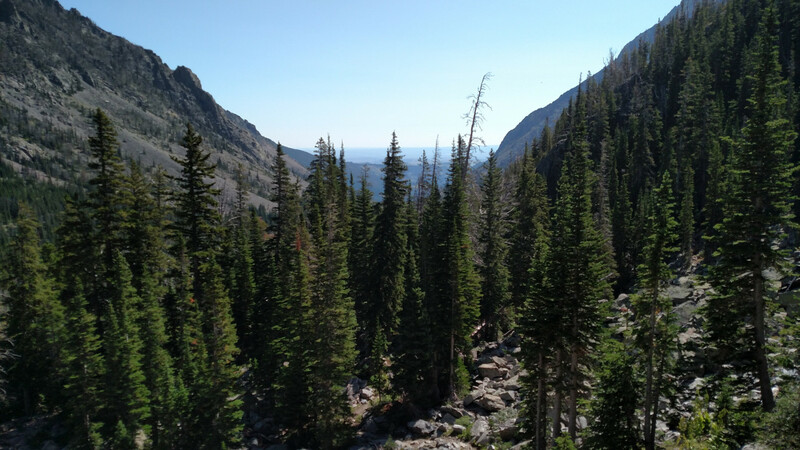 To the left is the Blue Lake trail which leads to Blue and Granite Lakes, passing Thunder Lake and Thunder Falls along the way. Granite Peak. Granite Lake is at its base. Massive mushroom. I wonder if it gets ya high? Intersection with Blue Lake Trail. After a short breather at the junction we took a left towards Blue Lake and headed up a series of moderately steep switchbacks. 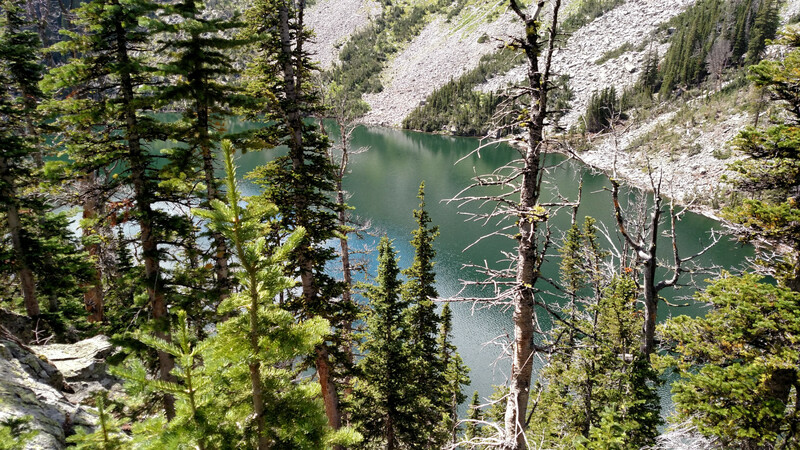 The trail then passes a pair of tiny, unnamed lakes, before leveling out at an overlook which provides stunning views of the drainage basin and surrounding peaks. Since there’s no official trail leading to Pear we took the opportunity to scout out our route. 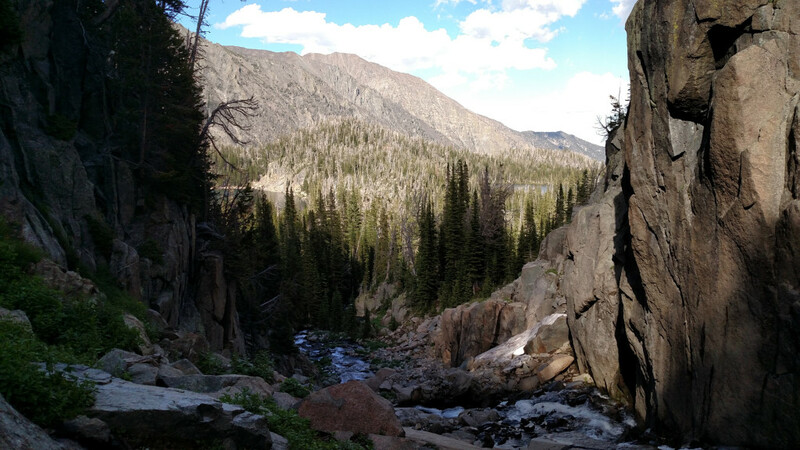 The obvious choice, we foolishly thought, was to head straight up a steep sided gorge that connects Pear Lake with Granite Lake. The other option was to climb the ridge to the left or right of the gorge and then drop into Pear. If that plan fell through we could possibly make it to Druckmiller Lake by following the drainage to the far right. View of the drainage basin from the overlook. The left drainage leads to Pear and the right to Druckmiller. From the overlook we descended into the basin. The trail becomes less defined at this point but it’s pretty obvious what direction to go. 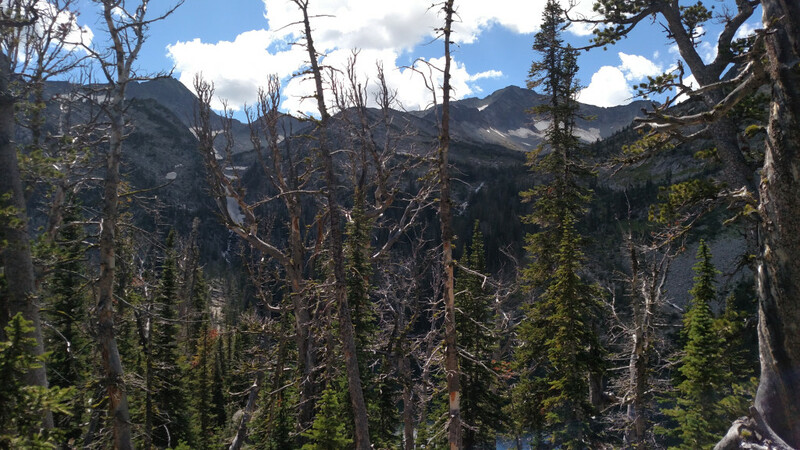 Thunder Lake and Falls weren’t visible from the trail but Blue Lake could be seen through the trees and we walked passed several descent looking campsites before arriving at the eastern shore of Granite Lake. A creek separated us from the southern shoreline so we were forced to wade across; the water was frigid and the bottom was rocky making it hard to maneuver, especially with a backpack on. After making it safely to the other side we de-packed and settled in for a quick lunch break in order to rejuvenate before the climb up to Pear. 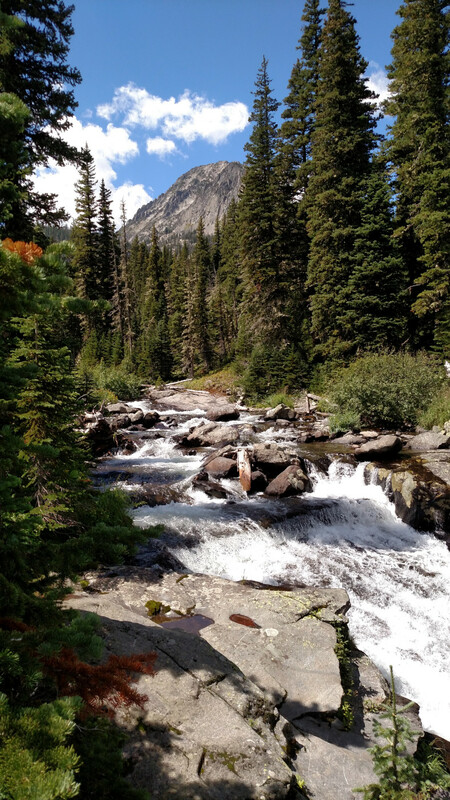 The creek we had to wade across leads up a third drainage to a lakeless cirque. We saw people coming down so it’s probably easy to get up. The trail is virtually non-existent at this point. Some random trails weave around the area but a bit of bushwhacking is required to make it through the woods to the start of the gorge. A well-established campsite sits right at the southern tip of Granite Lake. It looked like an excellent spot but a large group of campers had already claimed it for the night. The first up-close view of the gorge sent shivers down my spine. This thing would not be as easy to climb as we had previously thought. 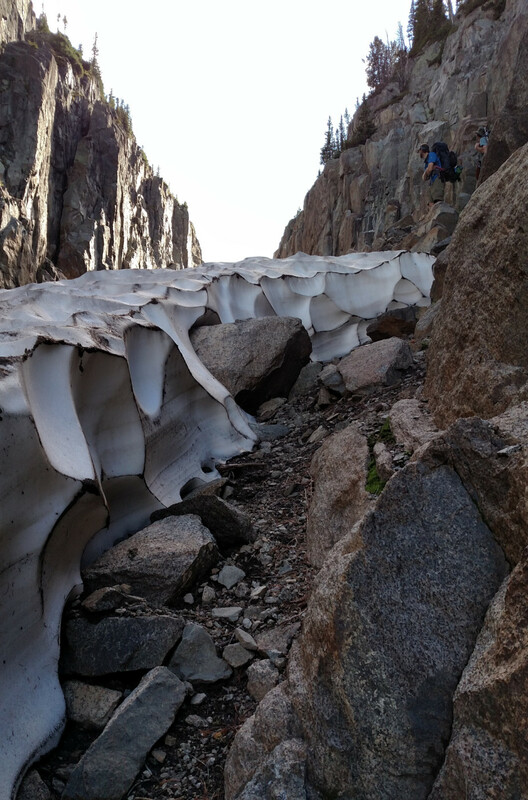 A gigantic slab of snow several feet thick covered almost the entire length of the gorge. The creek draining from Pear raged underneath the slab complicating the situation even further. How were we going to get up this thing? Traversing the slab was completely out of the question. There was no way we could trust the snow to support our weight and a plunge through it would certainly result in serious injury or death. The only other option was to climb up the side of the gorge where there was a small gap between the snow and the rock. First close-up view of the gorge. A massive sheet of snow covering the creek. 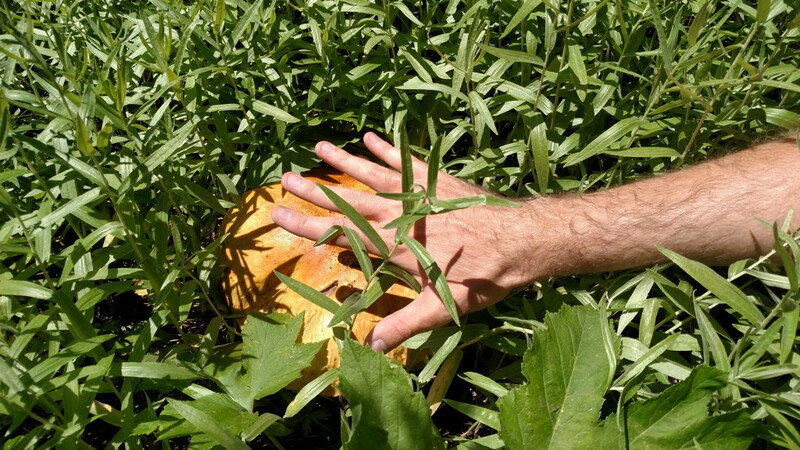 I’m guessing it persists all year but I’d like to return later in the season to investigate. Our initial attempt up the left side was thwarted when a turn in the creek prevented us from going any further so we turned around to attempt the right side. But first we had to cross the creek which was a challenge of its own. There were no simple crossings and having a heavy pack made balancing on small, slippery rocks exceedingly difficult. Eventually a safe(ish) spot was found so we took it and started up the right side. Things started out alright. The channel between the snow and rock was fairly wide and the ground was somewhat dry and level. But the further up we got the more dangerous the situation became. The channel started to narrow and the ground became slick with ice. Additionally, a chasm had opened up between the snow and rock, just barely big enough for a human body to slip through into the churning waters below. At one point the path closed up completely and we had to crawl our way up the snow slab a short ways until the channel reopened. Finally our luck ran out entirely. The channel vanished and we agreed climbing the remainder of the way up the snow slab would be unwise. It was tough admitting defeat. Pear seemed so close and I truly wanted to to make it there. But it wasn’t worth risking our lives over so we hesitantly turned around and made our way back down the gorge towards Granite Lake. View looking down the gorge. Granite Lake is to the left and Blue Lake to the right. At the shore of Granite Lake we just happened to stumble upon the perfect campsite. It was nice and flat for tents and even had a little creek running through it. 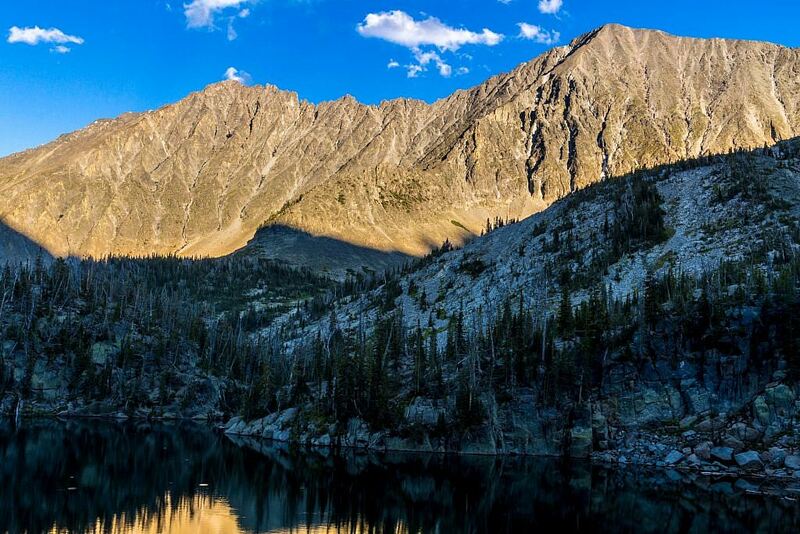 I was, however, still unsatisfied with our attempt at Pear and suggested that we continue up the western slopes of Granite just to see if Druckmiller Lake was doable with the little bit of daylight that remained. The climb up the slopes was rough. We were all exhausted and a bit frustrated with the situation. From the top of the slope the path to Druckmiller looked straight forward but the lake was still a good distance away and would require some bushwhacking. 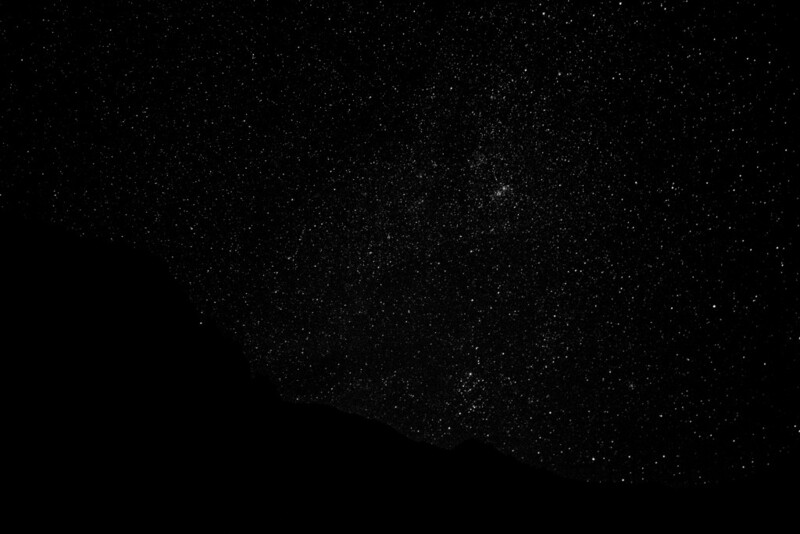 None of us were feeling up to the challenge so we decided to head back to the site and settle in for the night. Crazy and Big Timber Peaks before sunset. Looking north from the campsite at night. After the defeat of the previous day none of us were too enthused about lingering around too long in the morning so we had a quick breakfast, packed our things, and hit the trail. The return went smoothly and we were back to the car by early afternoon. It was a two hour drive which gave us plenty of time to reflect on the previous adventure and plan for the next. I have no idea what the future has in store but I’m sure one day we’ll return to finish the job and cross Pear off the list. One of the small, unnamed lakes.